The following is a list of events, including community outreach, exhibits and sales, that the guild sponsored and participated in during the 2015-2016 guild year. Join us on Saturday, October 3, 2015 as we have an open house at our Fiber Arts Center. Between 10 am and noon, guild members will enjoy our annual Giant Yard Sale and Weaver to Weaver Sale. There will be many items for sale including handwoven and handmade items, luscious yarns and fibers, weaving equipment, books and much much more. After lunch the fun continues when we open our door to the public. 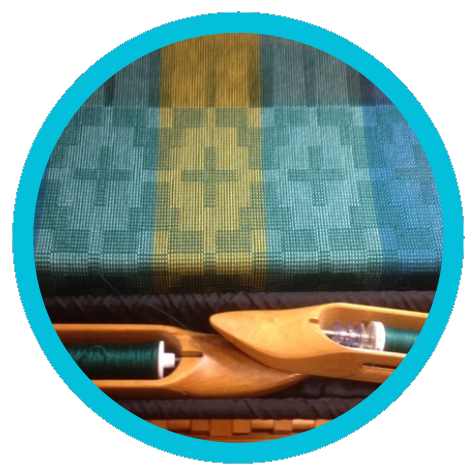 The Yard Sale and Handwoven Sale continues, and the Community Weave-In will begin. 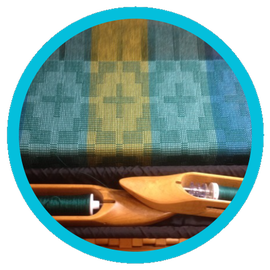 There will be several types of weaving looms set up for children and adults of all ages to try their hands at. Come join the fun! Members: If you need a table to display your sale items, click here to reserve a table. ELF is an imaginative holiday arts and crafts festival in Carrboro, North Carolina. 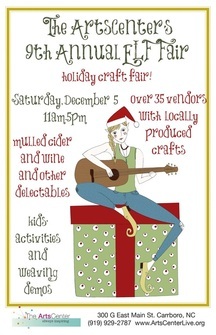 This is the ninth annual Craft fair at the ArtsCenter. ELF will be held in the Earl Wynn Gallery and the West End Theatre of the Artscenter. ELF wants to welcome and encourage the public to purchase holiday gifts directly from local artisans in an approachable and festive setting. Where: Fiberfest is moving back to the State Fairgrounds! We are looking for volunteers to help out with this wonderful event! Email Virginia Hedlund or Janice Kohl if you are interested.